Great news from Teesside Bikers – the Honda CD 185 motorcycle that they renovated and raffled at BikeWise 2011 made the sum of £2000 which will be donated to Zoe’s Place, the children's hospice. The bike was won by Syd Craggs from Newcastle who was attending BikeWise for the second time. Syd used to ride in the 70’s and was keen to win the bike, buying two lots of raffle tickets. He came back to biking about six years ago and passed his test and is currently riding a Honda Shadow. HM Plant Honda Race Team Manager, Havier Beltran will be travelling up to BikeWise 2011 from Honda’s Race HQ at Louth. ‘Harvey’ will have with him in the HM Plant Honda Race truck – the two BSB Honda Fireblade superbikes of reigning 2010 BSB champion Riuchi Kiyonari (who is currently in Suzuka, Japan) and also present championship leader Shane ‘Shakey’ Byrne. Honda TT legends, John McGuinness TT winning Honda Fireblade will also be there as will the new Honda VFR 800X Crossrunner. Further to our item of the 11th June : Click HERE to view news item – the road surface at Nenthead when you are travelling downhill towards the Miners Arms has still not been repaired. Please take care as you descend the bank and enter the left hand bend at the bottom of the bank. For those of you not sure of where this is… It’s the main road through Weardale as you head west, towards Alston (Hartside Cafe). Teesside Bikers have restored a Honda CD185, to raise funds for their adopted charity Zoë's Place Baby Hospice. BikeWise 2011 is almost here – Sunday 24th July…. HM Plant Honda Racing Team will be there with BSB Championship leader Shane ‘Shakey’ Byrne and 17 times TT winner John McGuinness. Darlington based world record holding stunt rider and BikeWise stalwart – Dave Coates will once again be thrilling the crowds with his two shows at BikeWise. As well as the above, the Police Dogs will be putting on a display, Motorschool will be giving skid pan and four wheel drive demo rides and the Police Helicopter will also be basing itself at the Police HQ. Tuesday 26th July 2011 - next meeting at Bowburn Hall Hotel at 1900hrs. Meet at 1900hrs for a 1930hrs start. 16+18 Market Place, Middleton in Tessdale DL12 0GQ. These will start on the 22nd March and will continue every Tuesday until October, from 1830hrs onwards. Last year the couple spent a lot of time and effort working at the rear of the premises and Restaurant 17 has now opened and taking bookings if you fancy a nice night of dining in the dales. To find out dates / meeting places of : Aycliffe Bike Club,Darlington MCC, Dragonslayers MCC, Lanchester Centurions MCC, Wetlands and loads of other ‘biking events please click on the link above which will take you into our events calendar. MCN Fantasy Road Race, in association with MCE Insurance is back for 2011! Once again the game is totally FREE to play. All you have to do is pick a six-man team of riders, comprising the stars of MotoGP, World Superbikes and British Superbikes, then just sit back and let them win you some fantastic prizes! The game started at on Saturday 26th February and the top prize, courtesy of MCE Insurance, is Yamaha's special edition YZF - R125 (worth £5,800) - celebrating 50 years of racing in World GPs. There are also seven 'Game Round' prizes to play for during the year, too. For more information on prizes, just click here. NEW THIS YEAR: Your BSB performance will be put to the test, too, in the all-new MCE BSB Game Round competition! All entrants with the two highest scoring MCE BSB riders for each Game Round will be entered into a prize draw, and of these, one entrant will be drawn out at random to win a pair of tickets to a future MCE BSB round. So select your riders today! Adelaide Insurance – If you have completed a BikeWise Training day then register your details on Adelaide’s website and you could win a prize in their monthly draw (like Mick Alder did...), you might also get a pleasant surprise when it comes to renewing your insurance. You will be able to select BikeWise Training from the drop down boxes and will get a discount as a result of attending your BikeWise Training day.. The team of Alison, Sue, Tim & Craig will look forward to seeing you and giving advice on your equipment needs. If you change your email address please let us know. Next meeting of the BikeWise Mini Bike Club will be on Sunday 17th July 2011. Signing on at 1000hrs for a 1030hrs start at Carrville Park and Ride. If you have any doubts about the weather please check your emails or the website before travelling. Karting North East will be hosting their Mini Bike Meeting at Warden Law on Monday 18th July 5pm – 8.30pm. Kenny Blair – owner of Durham Graphics at Dragonville has just ‘wrapped’ his new van and will be running around the area throughout the next couple of weeks advertising BikeWise 2011. 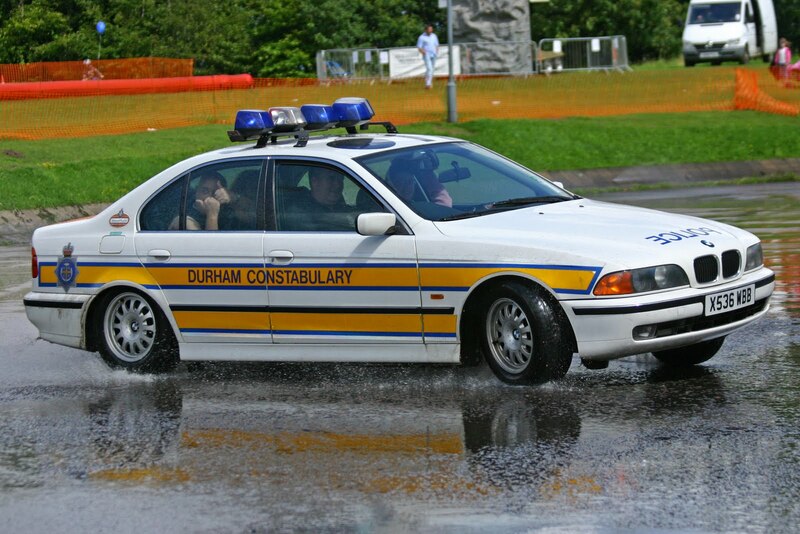 Durham Constabulary's driver trainers will be out at BikeWise once again, showing you how a vehicle can react under adverse weather conditions with the aid of the skid pan. If you've never experienced the skidpan - then make an effort to get to the show early to book your ride as there are only a limited amount of rides available throughout the day and it's an opportunity that you shouldn't miss. The driver trainers are some of the best drivers in the country and you will be able to ask them any questions about driving. Durham Constabulary's four legged '"friend's will once again be at BikeWise to show off their skills along with their handler's. The display by the dog section is always one of the most popular attractions at BikeWise as it give's everybody an opportunity to see what a valuable asset the dog's are to Police Officers during the course of their work. Times of the displays will be posted closer to the date of the show. 17 Times TT winner & Honda TT Legends team member & BSB championship leader, HM Plant Honda’s Shane ‘Shakey’ Byrne will both be at BikeWise 2011 along with Honda team manager Havier Beltran who will be bringing the HM Plant rig and the bikes from the Honda HQ at Louth. Sadly, HM Plant Superstock rider, Jason O’Halloran will not be there as he is still in hospital after a crash at Knockhill and Riuchi Kiyonari will be back home in Japan, preparing for Suzuka.